The achievements of nine leading students at the University of Ulster were honoured this week at a special Santander Scholars reception, held in the recently-established branch of Santander on the university’s Belfast campus. The University of Ulster is a member of the prestigious Santander Universities network Global Division, which has over 1000 partner institutions in 20 countries. He congratulated the Santander Scholars on their awards, and thanked the University of Ulster for its work in implementing the scholarship programme. Santander currently supports 1,0420 universities worldwide, approximately and 660 of which have become part of the UK network since activity commenced here in 2007. Since the Santander Universities programme started in Spain in 1996 Santander has directed £500m towards Higher Education worldwide in the form of scholarships, travel grants, support to special projects, academic and non-academic awards. 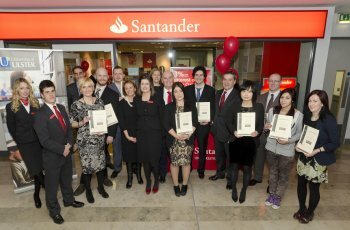 The Santander branch on the Belfast campus opened for business on 10 December 2012. It is provisionally scheduled to be officially opened in May 2013. The branch manager, Ms Laura McDonald, is a University of Ulster graduate.